Michelangelo Merisi da Caravaggio (1571-1610) is one of the most important painters of the Western art History, and also one of the most famous. His style, characterized by the strong chiaroscuro and by the central role played by the light, makes his works unmistakable. His influence on Baroque art has been so deep that later some painters were named Caravaggesque after him. Caravaggio is considered a modern artist not only because of his revolutionary painting, but also because of his troubled and violent life. He was born in Milan, where he made his apprenticeship. During the last years of 16th century, he started working in Rome, for the cardinal Francesco Maria del Monte. His fame spread, thanks to his particular art, that caused passionate debates. In this period he began to make big paintings, while various artists admired him and were inspired by his art. Caravaggio painted many religious works but he always chose humble characters and settings, according to the originary idea of the Church. However, some controversies took place. The Death of the Vergin, done for the Santa Maria della Scala church, was rejected. The Vergin is depicted with her feet and her ankles naked, but especially with her stomach swollen, as if she was pregnant. It is important to remember that often Caravaggio used prostitutes and homeless as models and he depicted them in a realistic way. 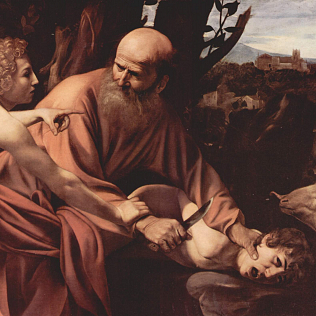 Meanwhile his troubles began: Caravaggio’s temperament caused several violent incidents. He was often arrested for brawls, insults to the city guards and weapons possession. According to some biographers, his transfer to Rome would have been due to the escape following a murder committed in Milan. In 1605 and in 1606 the most serious episodes took place. The first was the serious injury of a love rival. He had to ran away in Genoa, but his patron saved him. In 1606 he was injured, but he killed his rival and was condemned to be beheaded. The artist left Rome and began his escape. The Colonna family helped him to hide in their estates and also talking about some sighting, which were false, to the guards. In this period, beheaded men multiplied in his works: often they were self-portraits. He took shelter in Naples thanks to another branch of the Colonna family: it was a great artistic period for him. Later he moved to Malta. He wanted to become a Knight of Malta, in order to have the immunity and delete his death sentence. However, he had many troubles with the knights. the result of another brawl was that he was arrested. He escaped from prison and fled to Sicily. So, he was expelled from the Order. Back in Naples, he was attacked and disfigured: the false news of his death spread in town. Meanwhile he prepared his return to Rome, where he hoped to obtain Pope’s forgiveness. The ferry which left him in Ladispoli, about 40 km from Rome took away the paintings with which he would have to pay his freedom. He was sick, but he had to move again to retrieve it. He died in Tuscany, in Porto Ercole, probably for an infection. Another reconstruction sees him in Ladispoli, murdered by hired assassins of the Knights of Malta. In 2010 a research - conducted by several researchers of some Italian universities - including the remains of the mass grave of Porto Ercole has identified the bones of Caravaggio.